Mark Madler and his crew were thankful for the picture-perfect day in which they were working. Woodworth was referring to the weather, yes, but also to the work he, Madler and fellow line tech Jason Cavanaugh were doing. 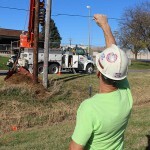 The trio were replacing poles along Fort Crook Road in Bellevue. A pole there had been “red tagged” by an OPPD contractor who inspects the approximately 240,000 distribution poles that make up a portion of the OPPD electricity grid. The process is part of OPPD’s Ground Line Inspection and Treatment (GLIT) program. 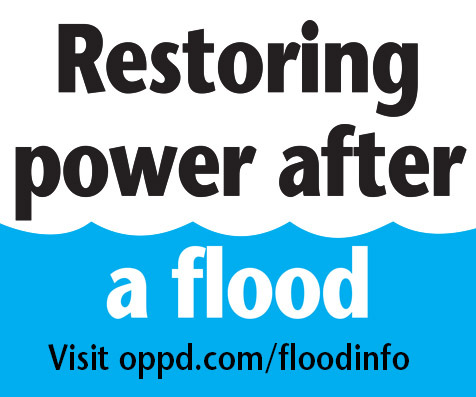 To ensure the grid’s reliability, OPPD goes to great lengths to make sure the distribution and transmission systems are healthy. The most visible method are the helicopter transmission inspection flights done twice a year over less populated areas. During the flights, line maintenance techs like Gary Wohlman and Mark Gorseth fly near over 1,300 miles of transmission line as part of the program. But while the flights obviously cover a lot of ground, Wohlman and his co-workers still spend plenty of time out on the road and down on the ground. It’s there that they get an up-close look at the poles as part of an overall asset management and maintenance program and reliability based philosophy. 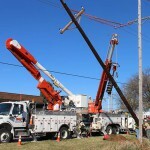 OPPD follows a set schedule for pole inspections, typically checking 10 percent of the poles each year. The program began in the early 2000s and inspections run on a 10-year cycle, said Patrick Hutchinson, engineer – maintenance optimization. 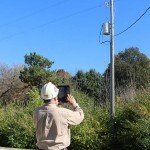 Gary Wohlman uses an iPad in the field to process work orders for pole replacement. Thanks to changes in the process, that backlog is becoming far more manageable. 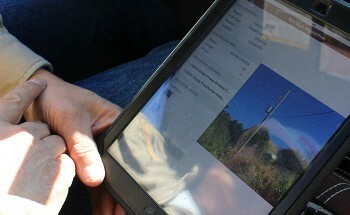 Line maintenance techs Wohlman and Gorseth work with iPads in the field to gather information on the rejected poles. On this day, Wohlman had a series of poles to check north of Blair. He pulled up the “red tags” on his screen and his iPad’s GPS led him right to the county road where he could easily see a pole with a red tag. The map used by technicians to locate poles that have been tagged for replacement. He was able to bring up that pole and a few others in the area on the iPad rather than spreading out a large map. Techs and crews used to spread out those maps on the dashboards of their work trucks before computerization. That’s just one example of how much easier the inspections and replacements are now. Hutchinson said that through updated technology and processes, far fewer hands are touching the work. The process change frees time for the various workers involved. When including time spent by crews, engineers and paper resources used, OPPD saves nearly $70,000 each year, Hutchinson said. 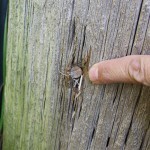 A pole that has rotted from the inside out and is tagged for replacement. Wohlman gets out of his truck and snaps pictures of the pole with the iPad. He attaches the photos to the work order he fills out from his screen. He inspects the pole and can create the work order from his truck. The work orders identify the materials needed and automatically calculate the cost and number of hours needed to do the work. A smaller number of poles are considered “priority poles.” The program designates these for replacement right away. Hutchinson said the poles suffer exterior damage from weather or car crashes, but the majority need replacement after rotting from the inside out. Poles can start to degrade faster in years 13 and 14. 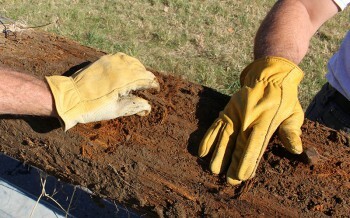 That’s when the treatment in the pole deteriorates and needs renewed through the GLIT program. Inspectors take small core samples – about the size of a cork – out of the pole to test its interior health. 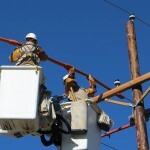 The work is not only important for the health of the electric grid. It also makes work safer for those who have to climb the poles. In 1948, 49-year-old lineman Arthur Pakiser died after falling 35 feet from a pole that broke off near its base in Herman, Neb. Another worker, Bert Christensen was also injured in the fall. Personnel patrol the poles from South Sioux City in the north to Rulo, Neb., in the south. Once crews complete a work order, it becomes “on the shelf work.” This means it is done between bigger projects, whenever it can be fit in. Some of them are pretty simple fixes – like the one along Fort Crook Road – but others are more complicated. Cody Woodworth, right, and Jason Cavanaugh place protective rubber sleeves over the wires to protect themselves while working from the bucket. The new pole is raised alongside the existing one so wires can be transferred. Mark Madler uses a leveling plumb to check the new pole after it’s raised. Gary Wohlman takes a picture of a pole that has been tagged for replacement, so when crews arrive they have a visual indicator of which pole to work on. A boring hole plug used to test the integrity of the pole’s interior.